I really liked the first book in the series. I cannot talk about Someday Maybe without talking about the first book in the series. I loved Definitely, Maybe in Love when I read it last year. I love Pride and Prejudice and I thought London's adaptation was excellent. Unfortunately for Someday Maybe, I've never read Persuasion, which I gather is Austen's tale of love lost and found again. So it didnt come with that added boost of joy as I compared storylines and anticipated moments and so forth. So... Rachel and Oliver both seemed like pretty honest characters. Rachel had made some poor decisions and was trapped by them, but she didn't *want* to hurt anyone. She was also conscious of the fact that she'd kind of sucked when it came to handling Oliver and her relationship during freshman year, and that made me like her even more. Making a mistake and realizing you've made it and regretting it are all good character development things in my book. Oliver was a bit harder to get a fix on, manly because I missed having Oliver's perspective - the back and forth of perspectives by chapter in so many new adult books has really spoiled me! Having to be more clever than our heroine and read into his actions? Geez! Maybe I'm becoming a lazy reader.... Regardless, he seemed like a good guy, and I'd kind of like to spend more time with him in future books in the series, to get to know him better. One thing I didn't really buy into was the friendship with Meghan - Meghan didn't seem like a particularly great friend to me, and I was surprised by the lack of 'air-clearing' between these two. I'd like to think that such great friends would at least attempt to address things when things felt a little weird, right? Now, story-wise (clearly secondary to characters for me), there's the present storyline and then flashbacks to tell us the story of Oliver and Rachel *before. * I did find that the flashbacks dragged a little - I didn't care so much exactly how things went down, as long as I had the gist of it. But I do think that overall, these bits were necessary to really develop the relationship between Oliver and Rachel in the present, so do power through them! 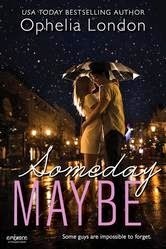 Someday Maybe is a solid contemporary romance. It was a relief to read a new adult without the characteristic uber-angst - sometimes the parade of damaged characters in this genre can be exhausting! I can't really speak to it as an adaptation of Persuasion but I can say that overall, I found the book pretty entertaining! For fans of Ophelia London, new adult, contemporary romance, second chance at love stories.